New Chitose Airport is the gateway to Hokkaido and each day several international direct flights arrive and depart. If there is no direct flight from your country, you can get to New Chitose Airport by way of Tokyo Haneda, Narita, Chubu Centrair, and Kansai International Airports. New Chitose Airport is located at 40 km southeast of the city center of Sapporo. Train (40 min. ): We strongly recommend catching the Japan Railways (JR) Chitose Line from the Airport to Sapporo Station which runs every 15 minutes (Fare: Adult 1,070 yen / Child 540 yen). Please take "Rapid Airport" train destined for any of Sapporo or Otaru, all of which stop at Sapporo Station. Bus (70 min. ): An express bus, known as the Chuo Bus / Hokuto Kotsu Bus also departs New Chitose Airport bound for Sapporo station (Fare: Adult 1,000yen / Child 500yen). Walking (7 min. 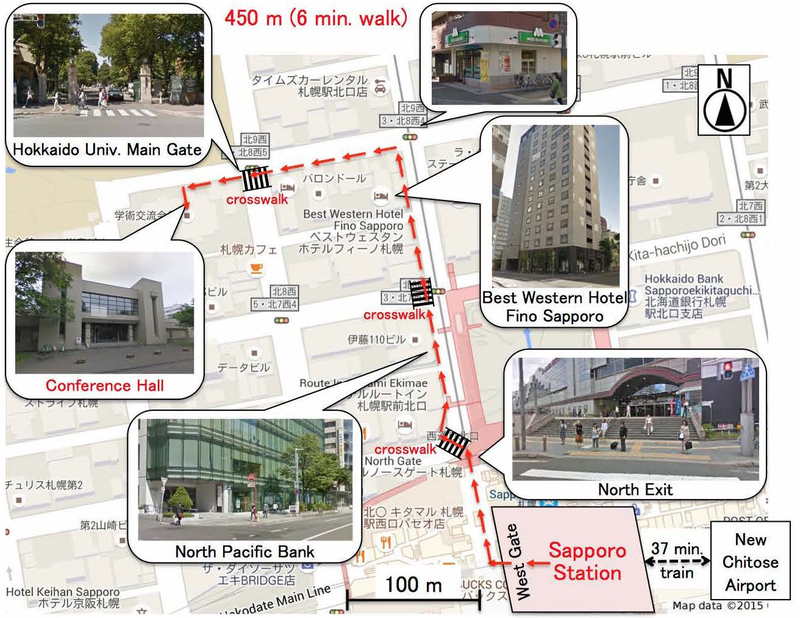 ): Once you arrive at Sapporo station, the main gate of the campus is a short and flat walk. After getting off the train, head for the west ticket gates and then take the North exit out of the station. Walk down the stairs, cross the pedestrian crossing and veer to the right of the Sunkus Convenience Store. Walk straight, passing the North Pacific Bank on your left, and continue for 4 minutes until you reach an intersection with a Mos Burger restaurant on right and a car park on your left – North 9, West 3 intersection. Turn left here and walk straight to the Main Gate of the Campus. Just upon entering the main gate of the campus, you can find the conference hall 20 meters ahead on the left (next to the information center).